Omega Cop is back! 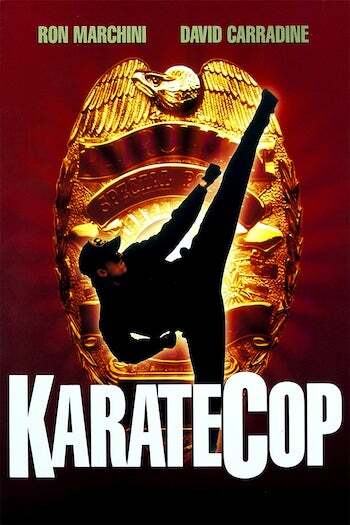 And this time he’s Karate Cop! Why? Because that’s the title of the movie! 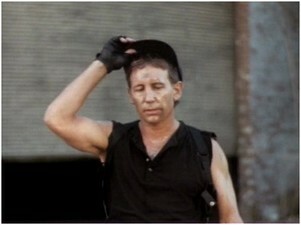 Ron Marchini, the short, stocky guy with large ears who in Omega Cop played the last of the Special Police on a planet suffering from the Greenhouse Effect, again plays John Travis in a post-apocalyptic tale of a guy obsessed with his hat! Thankfully, Karate Cop does not rehash the rescue mission Ron had to undertake to liberate his prized headgear from filthy toughs in the first film, but shows us scene after scene of him putting it on and taking it off! He even pauses while being pursued by a gang of thugs, so that he can take it out of his bag and slap it on his head! In a world gone mad, the only difference between man and mutant is his choice in official Special Police baseball-style caps! Karate Cop doesn’t just rely on the already established mythos of the John Travis character though. Yes, the singularly dour and vacant expression permanently affixed to Travis is there as is his penchant for getting chased all over run-down industrial areas of southern California, but this time he also has a sidekick named Mick! Mick is his dog and his dog’s special super power is the ability to never be around whenever trouble strikes! 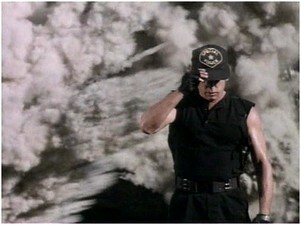 This means that Mick is hardly in the movie and never comes along on missions with Karate Cop! What a great freaking sidekick! The Omega Cop veterans reading this are likely wondering just how it is that John Travis is once again running around, putting his hat at risk yet again against mutant criminal gangs that now roam the countryside. After all, didn’t we see John swimming happily in the mountains with his three girlfriends at the conclusion of Omega Cop? Yes, but that obviously didn’t work out, or Ron Marchini simply forgot how Omega Cop ended because when Karate Cop begins, he is inexplicably back in the city helping out a different lady who’s got herself in trouble! Those of you interested in just who John Travis is and what sort of world he inhabits will have to hunt down a copy of Omega Cop if those are the sorts of things you need to know to enjoy a movie because Karate Cop doesn’t explain anything! Some chicks get chased by bad guys, one gets killed, and Omega Cop appears in dramatic fashion to save the surviving girl. There is never any mention of why the world’s gone to hell or just what this whole Special Police business is that John Travis used to be a part of. Naturally, Omega Cop finds that his morality which dictates he help out the downtrodden sometimes hinders whatever vague plans he and Mick have for the future. For instance, he has this nasty habit of leaving his vehicle out in the open where it’s susceptible to attack by the bad guys while he’s off helping troubled folks. And he does it twice! First, he has an old cop car that he just ditches when he’s on the run from a gang and he blithely announces he’ll go back for it later only to have to watch the gang destroy it before his very eyes! To his credit, he seemed only slightly more perturbed when he observes the gang totally trash his car before they finally drop a grenade in it than when he was watching the same gang kill one of the girls they took hostage. But then Omega Cop goes and manages to get his motorcycle stolen! And by David Carradine no less! Carradine fills the “embarrassing cameo by a guy you’ve actually heard of” slot that Troy Donahue had in the first movie. Carradine’s presence in Karate Cop is even more pointless than Donahue’s was in Omega Cop, as he’s playing the owner of a diner that Omega Cop has to deal with in order to get his motorcycle back. Carradine is in the movie for about five minutes and if Omega Cop had just been smart enough to hide his motorcycle in the nearby bushes instead of parking it out in the open, Carradine wouldn’t have had to be in it at all! Remember kids, securing your motor vehicle can help prevent the danger of actors you’ve actually heard of humiliating themselves in movies that you aren’t sure really exist even after actually watching them! The less said about what John Travis is up to in this movie, the better. When he gets back to the good guys’ hideout and they ask him for help in getting a replacement crystal for their teleporter, it was a testament to Omega Cop’s seasoned professionalism that he didn’t laugh in their stupid faces! Especially since the contraption was operated by punching some keys on a computer keyboard that everyone instantly knew how to use and also because of the digital message board the machine used which was like the ones employed at convenience stores to tell you how big the MegaMillions jackpot is or the special they’re running on beef jerky. Karate Cop is just as idiotic as its predecessor, though Marchini is even more pleasingly distant and uncharismatic as the action hero who spends a lot of time running his stumpy legs off and whining about how hard his mission has gotten. He even manages to get off one of those witty lines we expect after the good guy kills the bad guy: “assholes to ashes. Dictators to dust.” That line is overshadowed though because Karate Cop is the kind of movie where a woman can say “I’d rather rut with a mutant hog” and it actually stings! It’s amazing how Carradine (RIP) managed to create a “badass aura” despite not being particulary proficient in martial arts, physically impressive, or a very good actor either. He was more weird-looking than anything else, although in his later years he managed to give pretty nice impressions as evil/tough guys (check the deleted scenes of Kill Bill). Was Lone Wolf McQuade his first foray as a villain? In the great 1980 western “The Long Riders” he played Cole Younger. Not a good guy, but the movie was centered around the James and Youngers, so I’m not sure he was really a “villain” in that movie. Interesting as always, bud! I’ll check it out! In any case, it was a pity Carradine died -especially the way he went!-. He would have been a great addition to a number of movies, starting with the Expendables.